It's never been easier (or easier on the wallet) to create frugal and fashionable accessories that embody seriously unique chic. 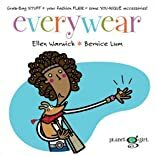 In keeping with the spirit of the Planet Girl series, Everywear encourages crafters to check basements, junk drawers and nooks and crannies for recyclable treasures before heading to the craft supply or hardware store. Introductory sections also include the tips girls will need to get started, including the lowdown on sewing, using tools, and more. UPDO IT - Swish hair sticks, Fab flower hair combs and other ways to swank up the ol' do, whether it's short n' sassy or long n' luxurious. FLASH IT - Perk-me-up jewelry ideas including a Va-va-voom vinyl wristband, Rings that rock and other projects to dazzle and adorn. WEAR IT - A too-cute tulip hat, Superstar sweater cuffs and other wearables to add a little ooh-la-la to any ensemble. STRUT IT - Fab bags to lend that finishing touch to a smashing outfit.